Previously, the losses were estimated at 220 million hryvnia. Head of the Verkhovna Rada Committee on National Security and Defense Serhiy Pashynskyy says that the March 23 fire in the rocket and artillery ammunition depot in Balakliya, Kharkiv Region, has destroyed ammunition worth $ 1 billion. "Tens of thousands of effective and expired ammunitions have been stored in Balakliya depot. When this chain reaction took place, we lost $ 1 billion worth of ammunition, which is unacceptable, because we are not that rich a country," Pashynskyy said on 12 April TV Channel 5. 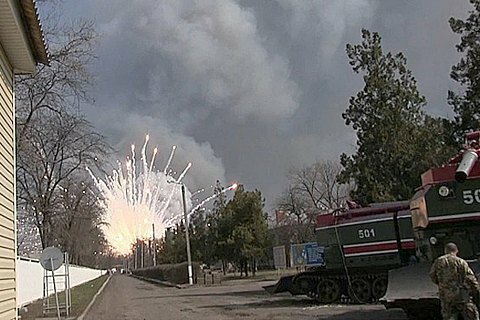 On March 23 a fire broke out the territory of Ukraine's largest military depot in Balakliya. The fire caused the detonation of 125-and 152-mm tank and artillery munitions. Ukraine's military prosecutor's office said the cause of the fire was sabotage. The depot has reportedly accommodated 138 thousand tons of ammunition. Defense Minister Stepan Poltorak said the fire destroyed 70% of them. The damage from the explosions was initially estimated at 220 million hryvnia. Taking into account the losses of adjacent industrial enterprises, the losses were feared to run into 300 million hryvnia.